The only video game console David Sherman has ever sold was his original Nintendo Entertainment System. It ended up being such a traumatic experience that he can still remember the precise day: Halloween 1991. “I sold it to a guy who ran a flea market table for $55 with all my games at the time … so stupid, but I was only 10 years old and did it without my Mom knowing,” said Sherman. He planned to used the proceeds to purchase a Sega Genesis without realizing he would have to come up with another $134. Suffice it to say, he learned his lesson, and now all of Keizer is benefitting from it. 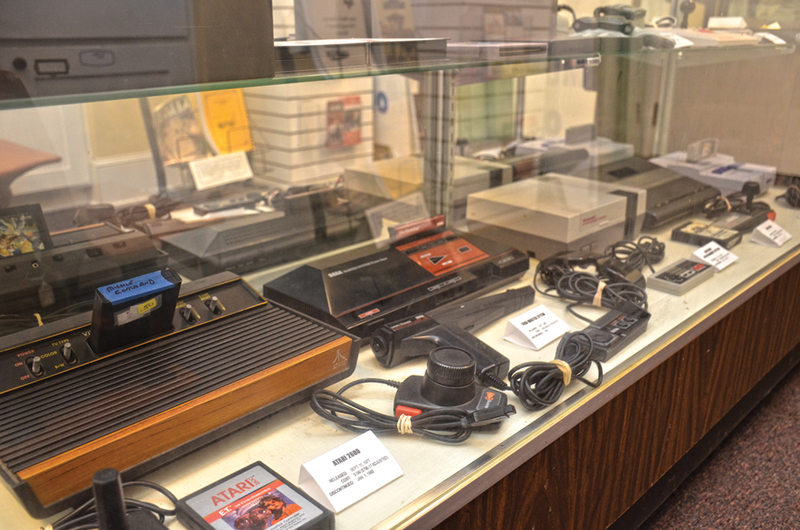 Sherman’s collection of video game systems, and some of the accompanying games is now on display at the Keizer Heritage Museum through the end of July. You can even play a round of Ms. Pac-Man, cocktail table-style, for a quarter. All the quarters collected by the machine are being donated to the museum. The Ms. Pac-Man table is one of the oldest elements on display, but Sherman said the only restoration he plans to do is, possibly, replace the glass top. People generally attach memories to senses, e.g. the scents that remind you of grandma’s kitchen. Sherman attached his memories to video game experiences. His collection of original Atari 7800 games once belonged to a cousin who died unexpectedly. The Nintendo 64 on display was purchased during his college years, primarily for the four pro wrestling games available on the system. He said those games are still some of the best of their kind even compared with modern-day hardware. He purchased a Sega Dreamcast and VR headset in 1999 when he was studying to become a game developer. “I used to carry it with me throughout Seattle while working at the Science Center or at school, and on breaks I’d simply plug in the power and put on my VR headset to get in some Soul Caliber or WWF action,” he said. While none of the items are particularly rare – and some, check out the NES Powerglove when you go, weren’t even particularly good – the exhibit is a stroll back through the first two decades of home gaming systems. Even with all the advances in modern gaming, Sherman said it is still hard to pick a favorite. “I have a lot of great connections to the Atari systems, but I have equally strong connections and stories about every console in the collection,” he said. The Keizer Heritage Museum hours are Tuesdays and Thursdays 2 to 4 p.m. and Saturdays 10 a.m. to 4 p.m.